Could someone explain the mechanical benefit of the pleats in action backs? Wouldn't they have the same effect on mobility as just having a very drapey back? When would one want action pleats, as opposed to under-arm gussets, or both combined somehow? I know this as golf pleat or back. It gives the golfer a wide range of move. The armscye is cut normal in my opinion. I saw a elastic fastened at the pleats across the back so that it will come back easily. I know coats were there are also some pleats in front. The conductor sleeve is used mostly when you raise the arm (dancer) - here it is the way a golfer moves his arms when hitting the ball. Action pleats give mobility to move the arm to the front. You are right to assume it is the same as a very drapey back, only it is cleaner. Underarm gusset gives mobility to lift the arm to the side, then upward. Wholly different movement than the action back. There is no reason to cut a low armscye, maybe your examples are RTW or made from a RTW pattern. I've seen coats where the pleat stops something like 5cm under the arm. It looks less good, and I think would be less confortable than having the pleat going to the waist. This has been around long before deep armholes. Deep armholes are relatively new. The theory of loose fit came from garments that were much closer fitting that didn't fit right, so deepening the armhole a little bit would be fine. Nowadays, deep armholes are exaggerated like saggers wear their pants waist band well below the waist. Sooner or later a younger generation is going to say this is ridiculous, and then these idiot armhole depths will be gone. I really think these idiot companies that make these ridiculous deep armhole are robbing the customers of their rights to better coats and shirts. The action back- there are directions in the MTOC for a method of cutting. What's MTOC and is it online? MTOC A couple of downloads. Hopefully somebody does the third vol. As a relevant aside, I was shown what is, most probably, a unique garment on my visit to Meyer & Mortimer (Jones Chalk & Dawson) last Wednesday. Mr. Munday, knowing I am curious about such things, had a DB dark blue (not as dark, I seem to remember, as night blue) Dinner Jacket /suit hanging in the fitting room. That DJ looked very nice but completely normal (lapels, pockets, facings…) until he showed me a single action pleat on the centre seam in the back, perhaps twenty centimetres long, positioned roughly at the same height as the shoulder blades. The reason for the pleat is that the bespeaker is a concert violinist, who has to look correctly dressed when not playing, but requires a range of arm motion unlikely to be needed by your average black tie-wearing bloke. Mr. Munday says he had misgivings at first but his customer insisted and convinced him to make it. I suppose action pleats are born of the general need to combine a clean line with an extended range of movement, whether for shooting or for playing the violin. Did Mr Munday showed you how me made the pleat keep closed when not in action ? The problem with the center back action pleat is that it usually gapes open, which I find not very nice, and very unwelcomed on a dinner jacket. No, he did not, and even if he had, I probably would not have understood ! He showed me the garment on a hanger and there was no visible gape at all, until he pulled the pleat open to show me. 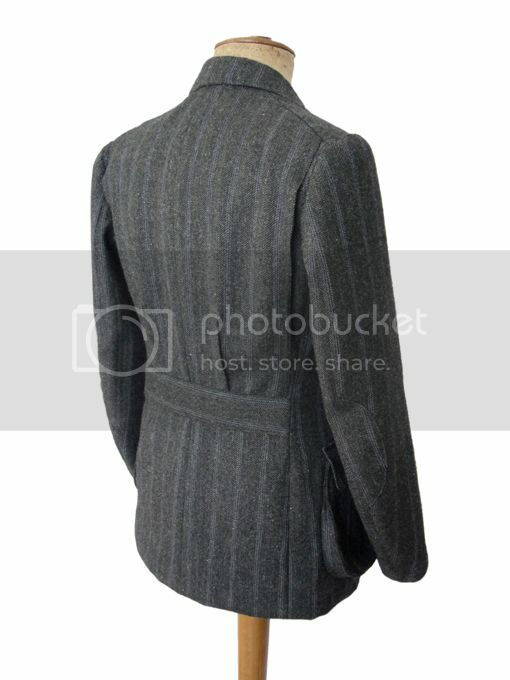 Here are some attached photo's of a vintage, half lined jacket with action pleats. I have taken photo's of the inside construction, as this is half lined. There is fusible interfacing in the inside to keep the pleat stabilized and looking crisp while being worn. These are the last three photo's that I took. If you view the last photo on the right, you will see the interfacing that keeps the outside part of the pleat stabilized, this in turn also topstitched .5 inches from the edge. Edited by jeffrey2117, 11 May 2015 - 11:46 PM. I have always liked these style of casual jackets, with action pleats, very comfortable. This suit is made in the same manner I was taught, it was made around 1970. The jacket is part of a suit and is very lightweight, with cloth that breathes well for the summer climate. If I hold the jacket up to the light, you can very well see through it, even though it has a heavier, "Look" to it. Perhaps I will make one for myself and hang it out front, someone may think it is cool and make a request! Does anyone have recommendations for a nice cloth, for hot, humid climates that would wear well for this project? Edited by jeffrey2117, 11 May 2015 - 11:49 PM. Jeffrey - This is a great question! I hope there are several answers, as I am slightly to your left in TN. This pleat was attributed to the 1930's heavyweight boxer, Max Baer. In this youtube video you will see the jacket and the pleat at 2.25 minuets into the video. We used to call it a Max Baer pleat when taking an order for this style. Edited by MANSIE WAUCH, 12 May 2015 - 06:30 AM. Thank you for the information, I had not heard them called that before. The box and action pleats were very popular in the USA around the late1920's through the 40's, as seen in innumerable movies from the time period. These modifications make for a very comfortable jacket for most outdoor activities. If anyone has an opportunity to view Regal's Garment cutter books, you will see directions were also presented for this pattern modification. The first time I was shown how to make one of these modifications and did it myself, through a bit of trial and error, I was amazed with myself, of course I was quite young at the time! The last time I made a jacket with action pleats was last year, for a safari jacket, it turned out quite well indeed. I just had to make a few changes to modernize the jacket slightly. Edited by jeffrey2117, 12 May 2015 - 09:31 PM. Here is a nice looking forest green tweed, 350g. 89,90 GBP. I like the look of the cloth, it may be okay to wear for the winter. I would like something suitable for the hot, humid summers. Edited by jeffrey2117, 13 May 2015 - 09:58 AM.